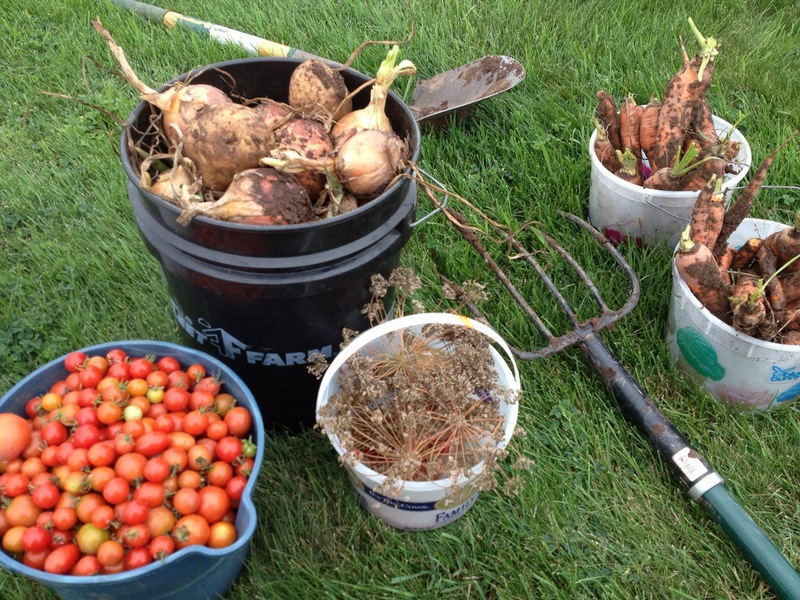 Finally this weekend, I found some time to get out in the garden to dig up the potatoes and carrots and pull the onions. A bathroom remodeling project during the last month left me with little time to spend in the garden other than harvesting tomatoes and raspberries. 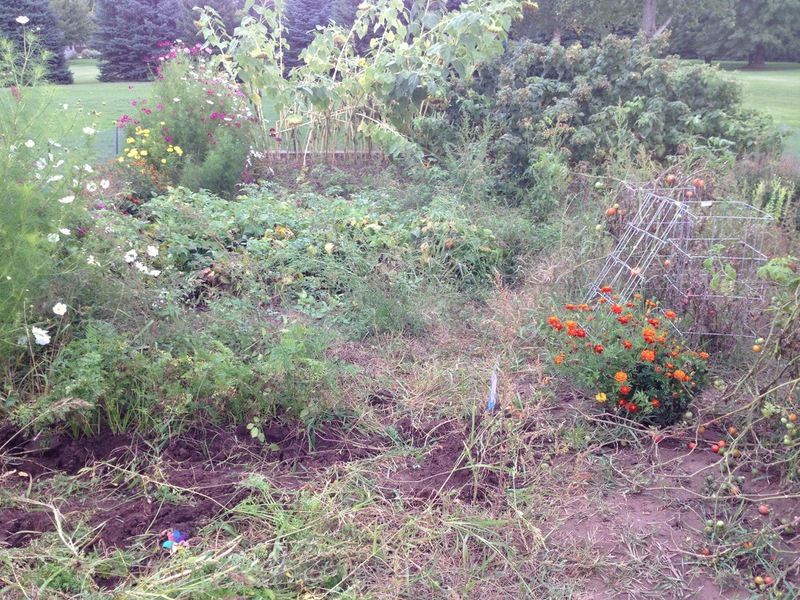 So, I figured all the now-foot tall (or taller) weeds would probably get in the way. Almost right away, I realized I should have pulled the onions earlier. We’ve been fortunate to get rain the last couple weeks, and although it’s been fabulous for the raspberries, I can’t say the same for the onions. There were several that were mushy at the root, and I’m guessing had I pulled them several weeks earlier, that wouldn’t have been the case. The carrots, too, probably should have been dug earlier, although for a different reason. The top portion of many of them had been nibbled on by some rodent, so once they’re cleaned, we’ll lose part of them. Fortunately, I planted quote a few, though, so we shouldn’t miss out on too much. I was only able to dig about half the carrots on Saturday after unsuccessfully trying to use a pitchfork with a bent tine. I tried to bed the tine back into place only to stab it into the ground, pull back on the fork and find the tine bent again. Usually in a place where it should have been pulling the carrots out of the ground. After a couple times of that, I tried using a spade, but that kept breaking the carrots off in the ground, which was still pretty wet from rain on Thursday. I decided it was time for a new pitchfork, took the reapings (photo below) up to the house and called it a day. 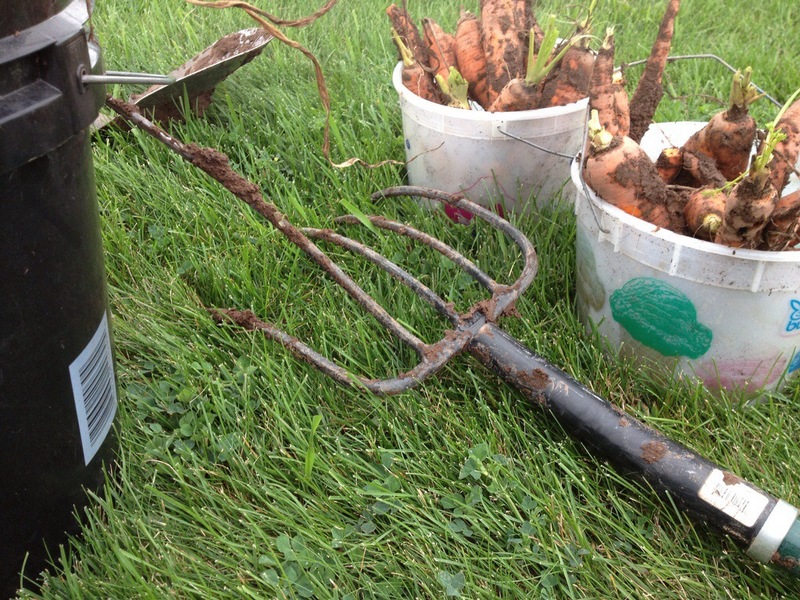 New pitchfork in hand, the rest of the digging went a lot easier on Sunday – for at least the carrots. I’m still not sure I got all the potatoes. 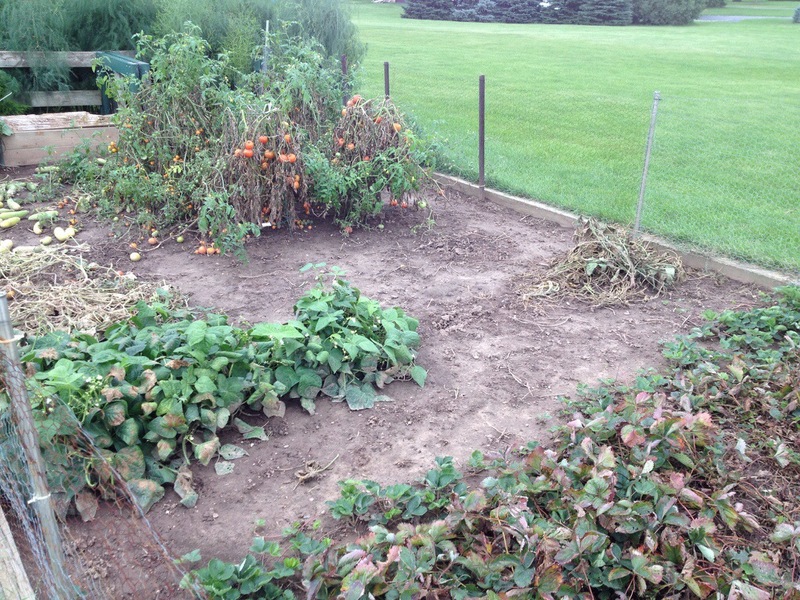 The weeds made it incredibly hard to see the four rows I had planted, and the sunflowers that are now bent over the potatoes didn’t help either. I think I got them all, but I guess I’ll find out once I till up the soil. 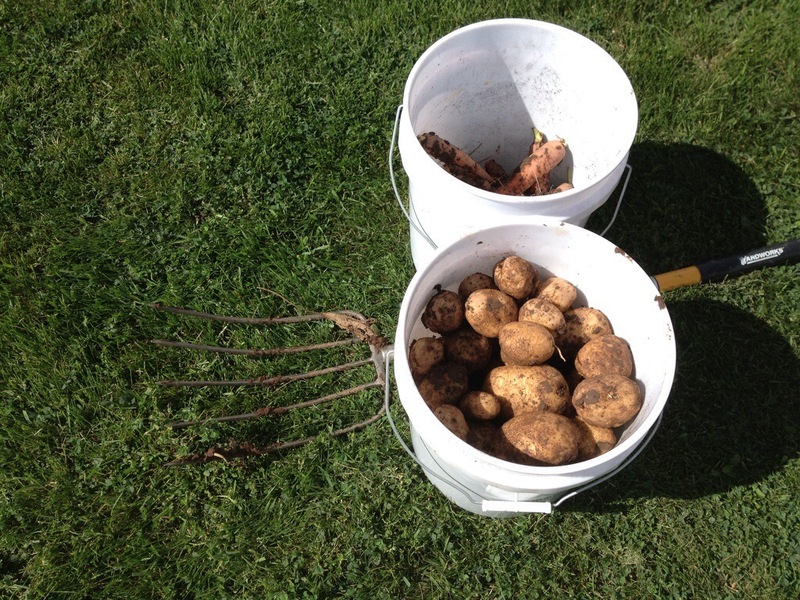 I dug about a five-gallon pail full of potatoes – an OK bounty, although I was a bit disappointed that several of the hills only yielded one potato each. If memory serves me correctly, those were the Yukon Gold. Not sure if I’ll buy those again next year. My weed-filled garden, above, is a far cry from my neighbor’s, below, which stands just feet from mine. I must point out that he is retired, so he does have more time than I do. Who knows, maybe in another 15-20 years, my garden will look like that, too. 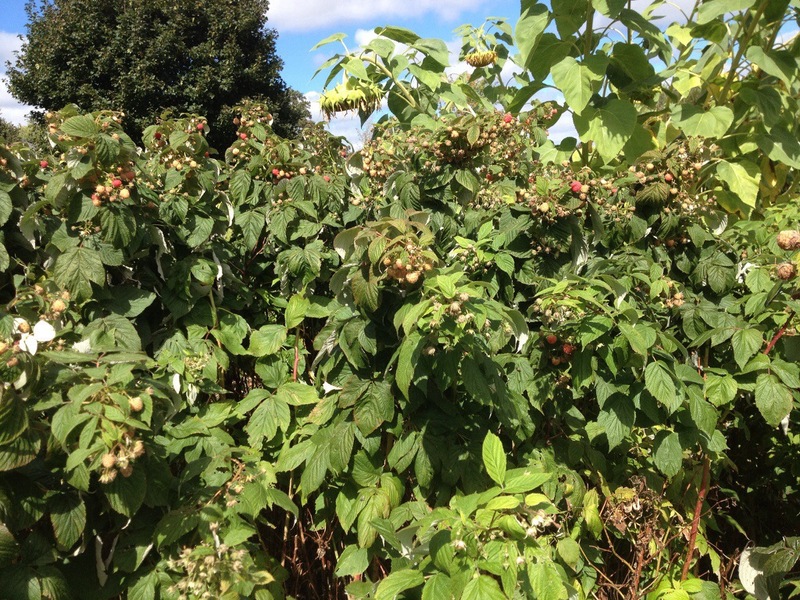 I’m not sure if you can tell, but there are still oodles of raspberries on the bushes. If the frost doesn’t hit tonight, it’s supposed to warm up after that and be above average for the next week. I should have no shortage of berries for awhile longer. I just hope I don’t meet it in another life. I’m guessing it doesn’t like me much.